The Republicans and Democrats on the House Energy and Commerce Committee have apparently suddenly agreed on a new 29-page draft CPSIA Amendment. This is a modification of ECADA and is probably the best that the House Republicans could extract from the Dems. 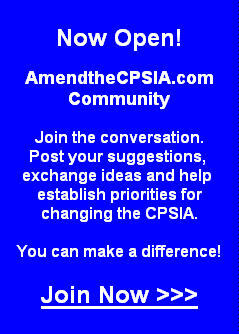 It is also part of a game of chicken between the House and Senate on how to amend the CPSIA. The bill is sponsored by Mary Bono-Mack and G.K. Butterfield, meaning that it is a bipartisan bill. It will proceed to the House floor for a vote tomorrow, cannot be amended and will only pass by 2/3 majority vote. It could be a voice "consensus" vote and will likely pass without opposition given its bipartisan character. a. 100 ppm lead standard is made prospective. c. ATV exception is included. This is death knell for any hope of later CPSIA amendments. This signals the end of the road. d. The terms of the bike stay are made into law. They also get a really sweet deal - as far as I can tell, they don't have to test metal components anymore. That provision is buried on page 19 in the book exception section. All the better to sneak it through. Nice for them . . . but no word as to why we must test metal components. Too bad for us, I guess. . . .
e. Resale goods exception is included. f. Testing rules are now based on "representative" samples, not "random" samples. The rest of the provision is based on the Eshoo amendment requiring further "inquiry" on reducing costs of third party testing. The Eshoo model still requires "assuring compliance" with the lead standards. This is the big dollar issue, as everyone knows, and is the one issue that touches everyone, all the ordinary businesses. This provision is a punt and offers little prospect for future relief. This provision is a huge time-waster and will never result in anything useful because the standard for relief is in the context of "assuring compliance". It also calls for more business "instruction" like that found in the current draft of the "15 Month Rule". [The status of the 15 Month Rule is not apparently addressed and may still emerge from the agency to bite us later this year.] The authors of the 15 Month Rule draft rule know exactly zippo about the real world and if we are ever supposed to follow their sage dictates, the losses will mount . . . fast. In any event, this Commission will never feel comfortable with anything less than prophylactic assurance, injury statistics be damned. I hate this provision because I don't trust the CPSC Commission under current leadership. Notably, this provision does not stay compliance with the testing rules due to go off stay at the end of the year pending resolution of the Eshoo inquiry. Congress has not dictated that the stay be extended, and believe me, it won't be. The reasoning behind this provision escapes me. g. Small batch manufacturers receive minimal relief ("reasonable methods to assure compliance"). The real sham part of this is the tantalizing prospect that the CPSC will actually deliver on this demand for testing relief. Call me a cynic, but they have received testimony out the wazoo for three years on this topic, and have yet to find a way to "help" the remaining micro-businesses in the market. And the reason we should believe they will make a afety testing discovery in the future? Your guess is as good as mine. They won't. Small batch manufacturers have to register before benefiting from this wonderful "relief". The registration requirement is deeply offensive to me and really shames Congress and the agency. What did these little companies do to deserve this treatment? What makes the House (Dems) think this is a good idea? It smacks of 1984 and is utterly detached from any rational assessment of risk. Do small batch manufacturers have an exceptionally bad safety track record meriting this kind of surveillance? Of course not. That they would accept or even support this treatment is shocking to me. In any event, no relief is offered to any company with gross revenues in excess of $1,000,000, so it's really just for the benefit of the really micro micro-businesses. It won't benefit me even for small unit volume items we currently sell - our top line makes us ineligible for any possible relief. Happy registering, little guys! h. Ordinary books and printed materials get a pass. i. Durable Nursery Products standards provision (not reviewed). j. Phthalates standard applied only to "plasticized" components and not to inaccessible components. Guess that means no more testing of paper, wood and metal. k. Authority to exclude items from tracking labels provision is given to the CPSC based on practicability. This is promising although the Dem hanging judges on the Commission have yet to make a single decision that saved a business a dollar for any reason. Don't hold your breath. l. Database rules are tweaked in a meaningless way consistent with the Markey proposal on database. NO relief offered. THERE IS NO RELIEF GIVEN TO EDUCATIONAL MATERIALS. Thanks, Congress. I am glad my kids are out of elementary school by now. That's it, more or less. Hope you like it, that's all you're going to get.